The Jewish Art Salon is curating an exhibition at the Charter Oak Cultural Center in Hartford, CT, and is inviting artists to submit their work for consideration. The exhibition is part of Charter Oak’s 2017/18 Annual Celebration of Jewish Arts and Culture, which will feature films such as Maria Sharapova: The Point, and Harvesting Stones, a Jewish Play Writing Contest, music by the Guy Mendilow Ensemble, and Jewish Comedy: A Serious History. Image: Laurie Wohl, Detail of ”Window of Prayers,” 45″ x 19″, Unweaving(R) fiber art, m/m, 2013. Card design by Katarzyna Kozera. “The human brain now holds the key to our future. We have to recall the image of the planet from outer space: a single entity in which air, water, and continents are interconnected.” – David Suzuki, scientist. This exhibition will bring together works that embody harmonious multiculturalism and inter- religious unity. In the current age, we focus on what divides, rather than what unites us. Artists are encouraged to submit works that highlight our common humanity, rather than our differences. Being around people who are different from us makes us more creative, more diligent and harder-working… Decades of research by organizational scientists, psychologists, sociologists, economists and demographers show that socially diverse groups (that is, those with a diversity of race, ethnicity, gender and sexual orientation) are more innovative than homogeneous groups. It seems obvious that a group of people with diverse individual expertise would be better than a homogeneous group at solving complex, non-routine problems. It is less obvious that social diversity should work in the same way—yet the science shows that it does. This is not only because people with different backgrounds bring new information. Simply interacting with individuals who are different forces group members to prepare better, to anticipate alternative viewpoints and to expect that reaching consensus will take effort. An art exhibition is an excellent opportunity for dialog and reflection, as artists have the ability to unite cultures through their work and intentions in a unique way. This show is an opportunity for open and honest conversation about how united, we can be stronger. Venue: Charter Oak Cultural Center, Hartford, Connecticut. 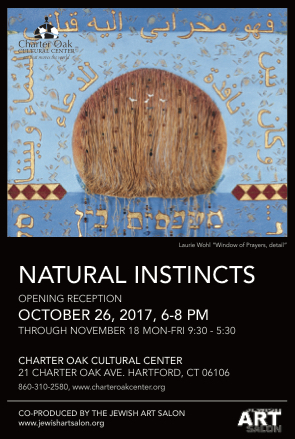 Opening Reception: Thursday, October 26th, 6-8 PM. All 2-D mediums welcome; artists at all stages in their art career are invited to submit. Works must be ready to hang. Other installation methods are possible in consultation with the curator. Size Restriction: 5 feet maximum width. The deadline for submissions is 11:59PM Sunday, September 24, 2017. Curator: Goldie Gross is a Brooklyn-based artist and co-producer of the Jewish Art Salon’s upcoming exhibition “Jerusalem Between Heaven And Earth” at the Jerusalem Biennale 2017, curated by Ori Z. Soltes. For the Jewish Art Salon she is curating The Invisible Jew, and Natural Instincts. She is also curating Sukkahwood at Inwood Park, NYC. She co-curated Art & Identity at Tzohar Seminary for Chassidus and the Arts. Curatorial advisor: Yona Verwer, artist and founder / director of the Jewish Art Salon. Special thanks to Joel Silverstein. Commission: Works that sell while on exhibit at Charter Oak are subject to a 40% commission, artist retains 60%. Artists are responsible for round trip transportation of their artwork. Mailed works (USPS, UPS, FedEx) need an enclosed pre-paid return address label. Mark all packing material with your name, including, vellum, plastic, and bubble wrap. Works need to arrive at the office between October 17-20 Tuesday – Friday 10-5. Submit up to 5 images that accurately represent the theme. Images should be 300 dpi, 1200 pixels on the shortest side, and should not exceed 10 MB per file. Save images as lastname.number. If the submission file of artwork isn’t saved as requested, the work will not be considered. The deadline for submissions September 24, 11:59 PM, 2017. Submit your work here, or press the button below. ← Call for Art: RESISTANCE!